Isaiah 62 is one of the most glorious examples of God’s heart regarding prayer for Israel. It is filled with His promises as He hears our prayers on behalf of His chosen land and His chosen people. He commands us to take no rest and give Him no rest in praying for Israel until Jerusalem becomes a praise in the earth (verses 6-7). We have a responsibility to be watchmen on the wall…committed prayer warriors on behalf of Israel. So, let’s dive into ICEJ’s Isaiah 62 Prayer Initiative where we will literally join hundreds of thousands of other praying friends on the first Wednesday of every month, in prayer on behalf of Israel. We focus on one of the 12 verses of Isaiah 62 each month. PRAISE: Eternal God, we praise You. You are able to transform desolations into delights. The forsaken become desirable in Your hands. Keep us mindful of this during the dry and lonely times. PONDER: In verse 4, Zion is called by four names. Two are negative and in the past, while two are positive and yet to come. God promises that the people and land will undergo a transformation from “Forsaken” and “Desolate,” that is, from those who have been turned from and left astonished and devastated, to “My Delight is in Her” (“Hephzibah” in Hebrew) and “your land Married” (“Beulah” in Hebrew). That which was destitute and ruined becomes a delight. According to Revelation, Zion is “the holy city, New Jerusalem, coming down out of heaven from God, prepared as a bride adorned for her husband.” (Revelation 21:2) And it is for Hephzibah and Beulah that we pray! PRAY: Using current prayer points, please commit time tomorrow to join others all over the world in prayer for Israel. 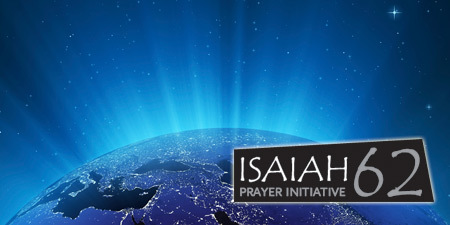 Why not pledge to pray, and consider joining an Isaiah 62 Prayer Group in your area? If you are in the Phoenix area, the Isaiah 62 prayer group meets at Calvary Community Church (Room 301) at 6:00pm the first Wednesday of every month. Find information here. Meet you in the throne room! PS: Join us tomorrow as we dive back into our study, Why Israel Matters: Rightly Relating to Our Jewish Roots. Previously, we looked at three great Bible Covenants. Now the excitement builds as we turn our focus to a fourth great covenant. You won’t want to miss it! See you tomorrow!